Healthy ice cream! 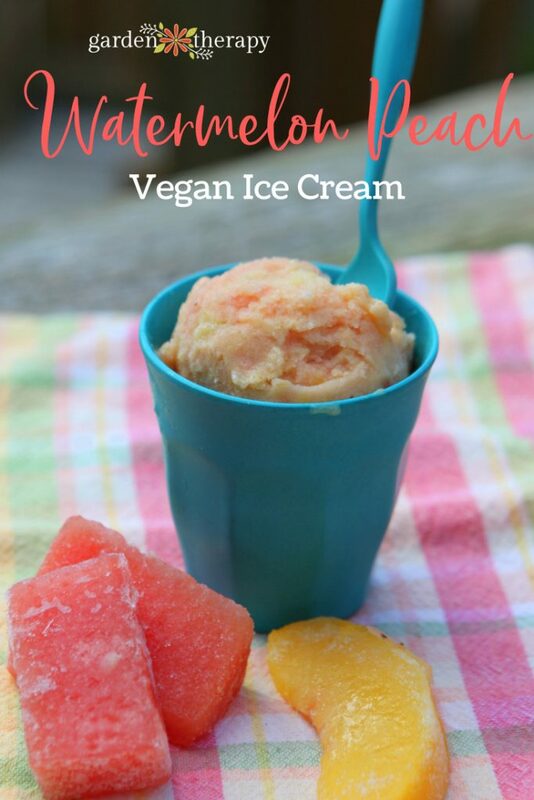 Healthy, no-sugar-added, dairy-free, all-fruit, vegan ice cream! Now that I have your attention can I also say that it’s smooth, creamy, and tastes delicious too? Does this seem too good to be true? 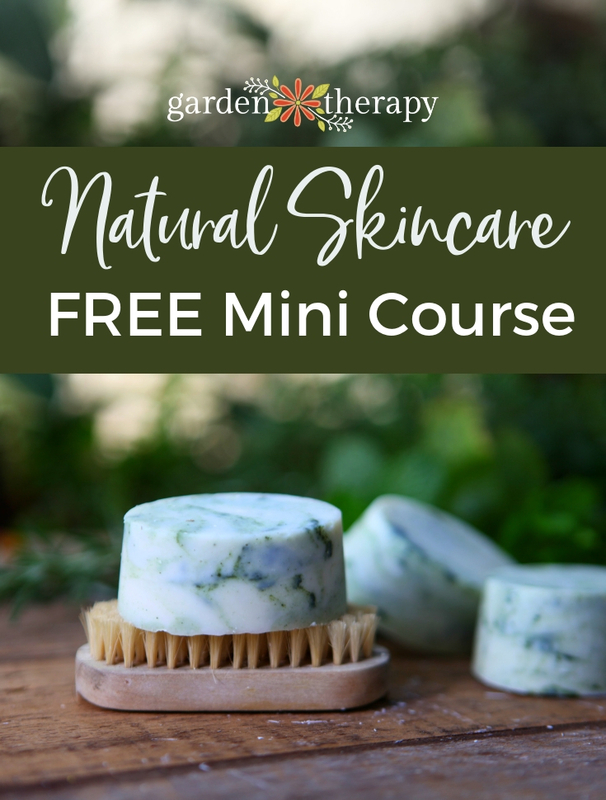 It’s not, and here is how to make it. I volunteer at UBC Farm as a Master Gardener “Farm Friend” with a school-to-farm program. The children come to the farm each week to learn about growing, harvesting, and preparing food fresh from the garden. Each week the children get a different job working around the farm. One of the favorite jobs is “chef,” where they use farm-fresh ingredients harvested by the other children and make a yummy treat to serve to the group. When my group wore the chef’s hats, they were delighted to learn that they were making ice cream. But not just any ice cream. An all-fruit, no-dairy ice cream that was made simply by processing frozen fruit through an old-fashioned burr grinder to produce a frozen dessert with a smooth, creamy texture just like ice cream. Not long after that day, I got a soft-serve machine. It’s essentially the same as the old-fashioned grinder that we used at the farm but in a modern package and with modern recipes. The following recipe shows you how to make vegan ice cream in a soft-serve machine, but you can also use a high-powered blender like a Vitamix. Simply add all of the ingredients and blend until smooth and creamy. 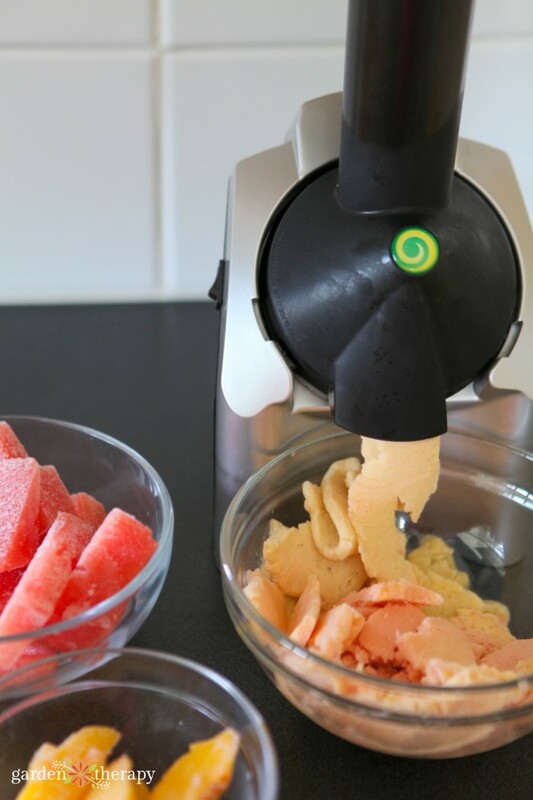 Making yummy all-fruit ice cream is very easy. You start with bananas that have just a few speckled brown spots (cheetah spots). Peel them and toss them in the freezer for 24 hours. Then they are ready to be used as the base for the soft serve fruit ice cream (their creamy texture is what makes the final result so similar to regular ice cream). Add any other frozen fruit or yummy ingredient that your imagination can think of. You can mix up flavors like banana chai, blueberry yogurt, or even cookies and cream! Since we’ve had the machine we tried many combinations but I’ve settled on a favorite to share here today: Sunshine in a Bowl. 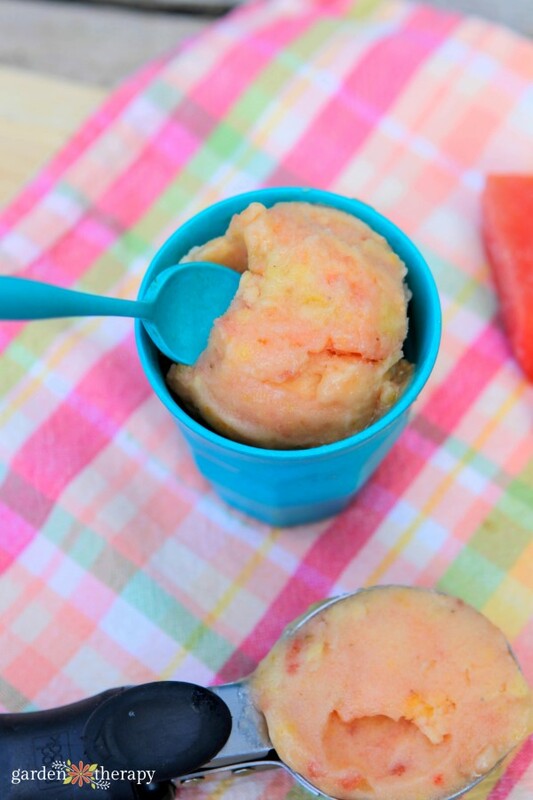 This is a recipe we made after freezing a large watermelon and giving it a try in the soft-serve machine. 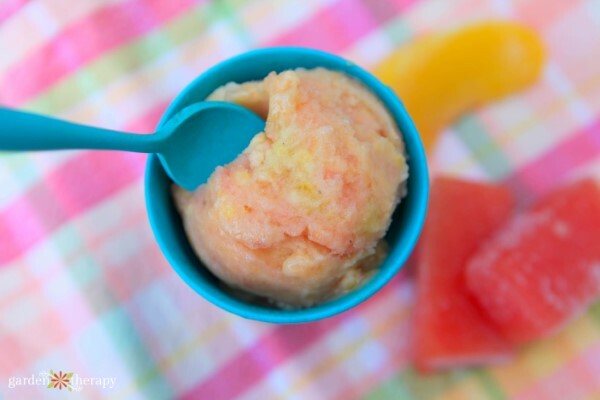 It turned out a beautiful color with a sweet, summery flavor that’s like no other! Making frozen vegan desserts is very simple. 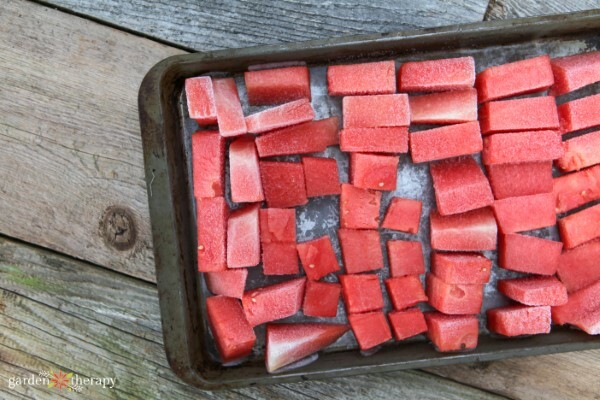 Start by removing your frozen fruit from the freezer and allow it to thaw for 7-10 minutes. 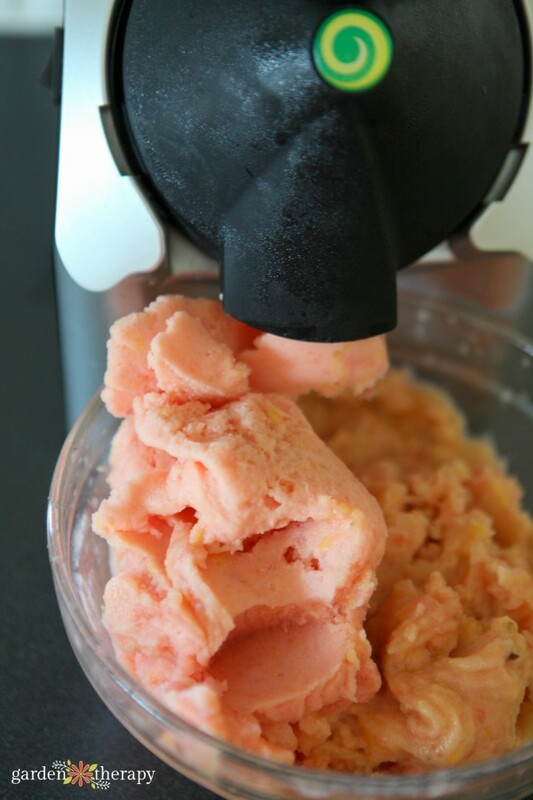 Add the fruit into the top chute of the soft-serve machine and use the tamper to push the fruit into the grinder. It will pour out into a bowl at the bottom looking like soft-serve ice cream. When you have processed all the fruit, disassemble the machine and scoop the extra out of the inside of the grinder. There’s lots of good stuff in there so you want to make sure you take the time to take it out. Mix the fruit together little bit. I like to mix it together so that it is smooth and creamy but not too much so that you lose the differentiation in the color. There are so many vegan ice cream recipes that you can make with this simple technique and I love experimenting! I’d like to know what new flavor combinations you come up with. Tell me what you come up with in the comments section below. 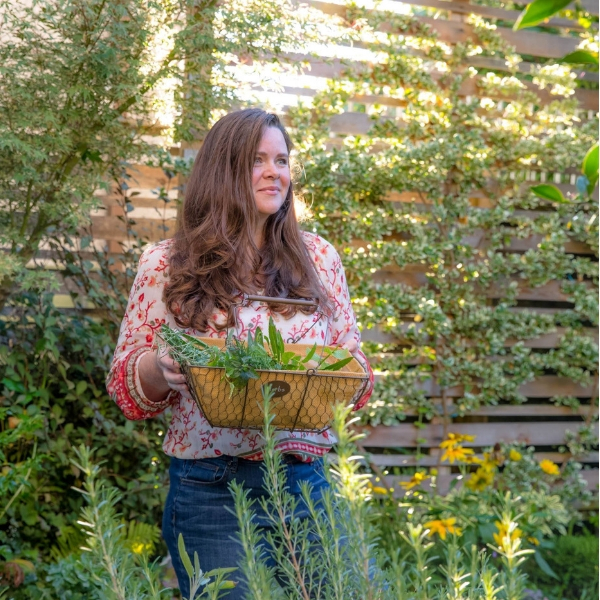 A Patio Fruit Garden is a Sweet and Pretty Summer Treat! I haven’t seen seeds in watermelon for years…but if they have seeds you can pick them out pretty easily when in cubes.